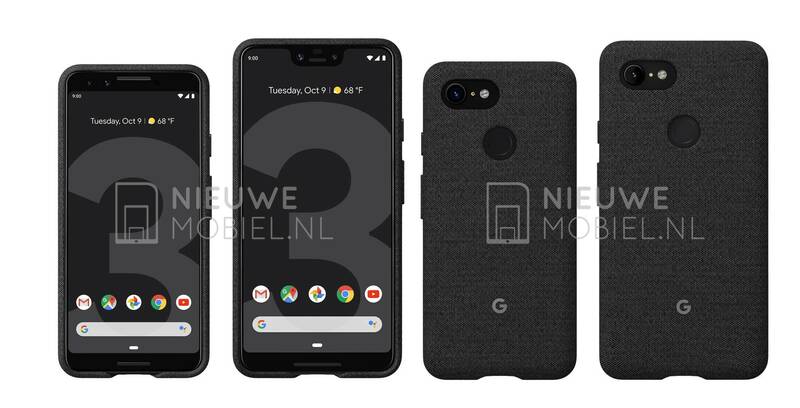 Press images from Netherlands-based website Nieuwemobiel.nl give a closer look at Google’s upcoming Pixel 3 and Pixel 3 XL. It’s not the first time we’ve seen renders, or even live photos and videos of the Pixel 3 and 3 XL, however, these are the official fabric cases. Google launched the fabric cases with the release of the Pixel 2 series last year and it seems the company is bringing them back. The renders also indicate that the new flagship Android smartphones will have the Google Assistant icon embedded within the Google Search bar. While these renders look legitimate, what’s also interesting here are the size of the bezels. It appears both the Pixel 3 and 3 XL have a thinner bottom bezel than what revealed in previous videos and images. There is the possibility that Google might have made slight changes to the handsets, or those leaked versions were pre-production units. Rumours indicate the Pixel 3 XL will feature a 6.2-inch display, while the Pixel 3 is to sport a 5.5-inch panel. Otherwise, leaks suggest both phones will use a Snapdragon 845 processor, 4GB of RAM and have Android 9 Pie at launch, on October 9th.